Darius Pliskauskas is about to open the scoring for Phantoms against Swindon. Photo: Tom Scott - AMOimages. Peterborough Phantoms continued their impressive English Premier League surge on a night which featured a hat-trick of hat-tricks (November 5). The city men powered to a third successive victory when sinking Swindon 4-2 at Planet Ice last night (November 5). It also completed a full set of three home triumphs against the Wildcats this season with the Wiltshire side previously sent packing from Bretton by 6-1 and 3-1 scorelines. And the latest success also featured a trio of assists from Czech import Petr Stepanek - a man whose considerable class, to go with his giant frame, is now showing through on a regular basis. 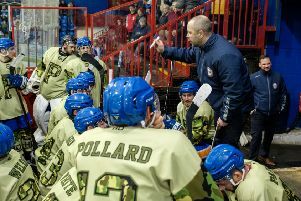 Coach Koulikov said: “Swindon are a tough team with lots of offensive power, so three wins against them at home is very pleasing. “It wasn’t quite a 60-minute performance, as I felt we took our feet off the gas at times, but we picked our levels back up and did enough to get the victory. Phantoms' ace Ales Padelek shoots from distance against Swindon. Photo: Tom Scott - AMOimages. “It was a team effort again. We took enough of our chances, we did well defensively and Janis made a couple of big saves when we needed him. “We started the season with a tough schedule, then we had a really difficult spell with lots of injuries, but hopefully we are now out the other side of that and we can kick on. Phantoms hit the front inside two minutes as Darius Pliskauskas squeezed the puck in from what appeared to be an impossible angle, but their advantage was wiped out a second before the mid-point of the opening session as Max Birbrear struck on a Swindon breakaway. The teams again traded goals in the second period, but this time it was the visitors who hit the front despite being without injured player coach Aaron Nell and impressive import Tomasz Malasinski, due to international duty. Youngster Jordan Kelsall struck a fortunate powerplay effort, which dropped over the shoulder of Phantoms netminder Janis Auzins and was inadvertently touched into his own net by captain James Ferrara in a despairing attempt to keep the puck out. But Phantoms replied with a powerplay effort of their own as a fierce Stepanek shot was spilled by visiting netminder Stevie Lyle and James Archer pounced for his third goal in two games. It left the game going into the balance in the final session when Phantoms’ quality told. Tom Norton capped a memorable week, which featured a Great Britain international debut, with a smart strike from a perfectly weighted Stepanek pass before the same supply line was responsible when Ales Padelek rifled through the legs of Lyle. Stepanek’s fine display deserved a goal but he was one of two players – Will Weldon the other – to be denied by the bar as Phantoms sought to put the game beyond the reach of Swindon. But the visitors eventually did that themselves. No sooner had they pulled Lyle than their captain, Jan Kostal, clattered into Auzins to earn a penalty. Swindon threatened to completely lose their discipline in the closing couple of minutes with Sam Bullas spoiling for a scrap, but Phantoms refused to be sucked into any shenanigans as they stretched their winning run. And they now have the opportunity to complete a second successive four-point weekend when making the long trek to basement side Manchester today. A near 400-mile round trip to the temporary Phoenix base in Blackpool awaits Koulikov and his men. He added: “It doesn’t matter who you play in this league anymore. You have to be switched on and mentally ready for any game.